The earliest mention of a flag for Serbia dates all the way back to 1281, with a description of the flag of King Stefan Vladislav, which was a horizontal bicolour flag of red and blue. However, the oldest known flag dates back to a map drawn in 1339. The flag detailed as representing Serbia was a yellow banner, with a red, two-headed eagle. In 1835, the Sretenje Constitution detailed a new flag for Serbia, which listed the flag as being a horizontal tricolour of red, white, and blue. However, there was a lot of criticism because the flag was so similar to the revolutionary flag of France. So, the new constitution included an article detailing that the flag be red, blue, and white. Essentially, the flag in use today. One legend of this is that a delegation went to Russia to seek help for the nation. Later that evening, during a celebration, the Serbian delegation realised that they had no flag. So, they took one of the Russian flags, and flipped it upside down. 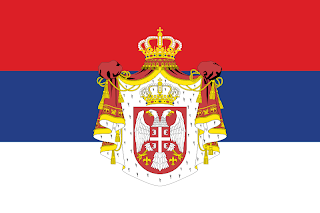 From 1804 to 1817, the Serbians rose in revolt against the Ottoman Empire, and in 1817, the Ottoman Empire ended the revolt by granting Serbia independence, and the Principality of Serbia was born. The flag chosen for this fledgeling nation was the Serbian red, blue, and white tricolour. In 1882, the Principality was elevated to the level of Kingdom, and in 1892, adopted a new flag. This flag took the Serbian flag, and defaced it with the Kings coat of arms. The Kingdom disappeared in 1918, when it was merged into a new, larger state after WWI, and became part of the Kingdom of Yugoslavia. This new state used a horizontal tricolour with the pan-Slavic colours, but this time, arranged blue, white, red. In 1945, the Socialist Republic of Yugoslavia was formed, ending the monarchy. Yugoslavia was divided into 6 constituent republics of Bosnia, Slovenia, Croatia, Macedonia, Montenegro, and Serbia. Each state gained a flag for internal use, and the Serbian tricolour returned. However, it was defaced with the star of communism. A red star edged in yellow. 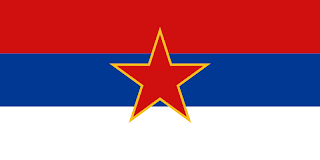 With the collapse of Communism in Yugoslavia, the flag was altered with the removal of the star. Slowly Yugoslavia dissolved, until a rump-state was left, just made up of Serbia, and Montenegro. This was loosened with Yugoslavia being changed to a looser federation of Serbia and Montenegro, and finally, it was completely dissolved with Montenegro voting to be independent. 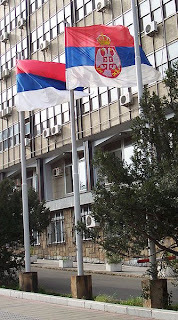 The state of Serbia came back into existence in 2006, and saw the maintenance of the Serbian tricolour as the new states civil flag, and a state flag being brought into being. The state flag features the coat of arms placed towards the hoist of the flag.